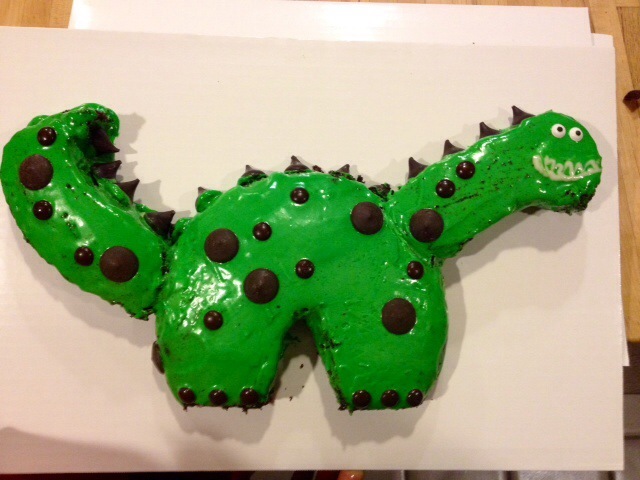 [Kerean] I think I really impressed Maia (and myself) this year making her a dinosaur cake that actually looked like one! 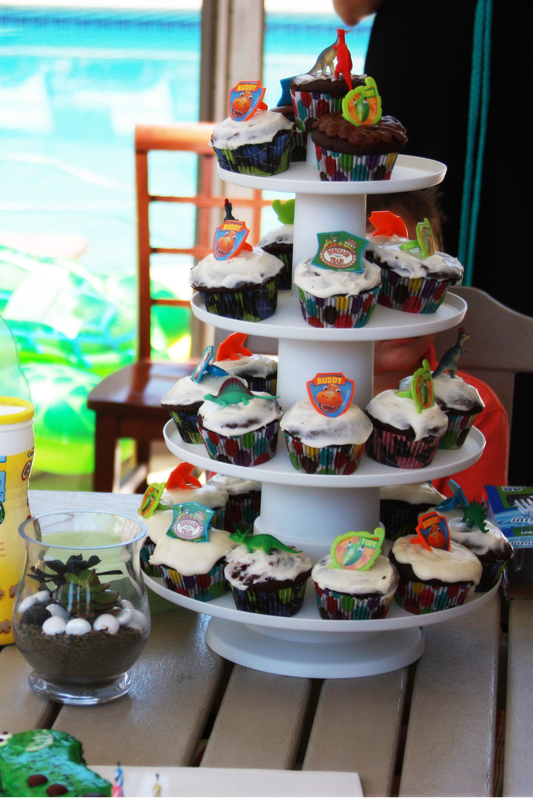 Her dad didn’t do a shabby job on the cupcakes either though he got some help with decorating. The cake turned out so well it gets it’s own blog post! Here is the recipe for the cake. At the very end is the online source where I found it three years ago. It’s the recipe I bake every year for Maia’s birthday and I am always told how delicious and moist it is. It’s easy to bake and it’s so good you would never know it’s vegan! If you go to the link there is a recipe for chocolate syrup to drizzle over the cake, which I have tried before. I layered the cake with strawberries and then drizzled the syrup. It was wonderful but this year I wanted to do frosting instead. 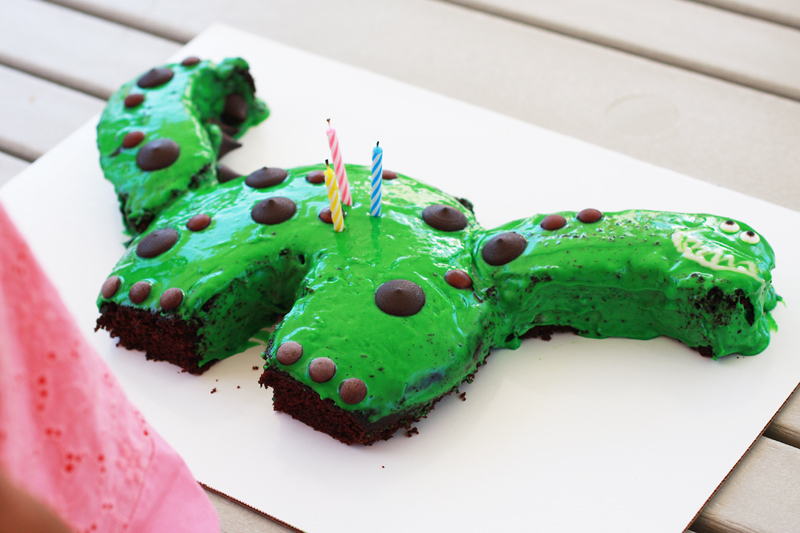 A dinosaur cake requires it! Preheat the oven to 350 degrees F. In an 8X8 square pan/dish, mix together flour, sugar, cocoa, baking soda, and salt with a fork, making sure it is really blended together. Add the water, vanilla, oil, and vinegar, and again, mix together so that it’s really blended together. Use a spatula to scrape down the sides if necessary. There is also a how to video on Betty Crocker’s website on how to use the template. 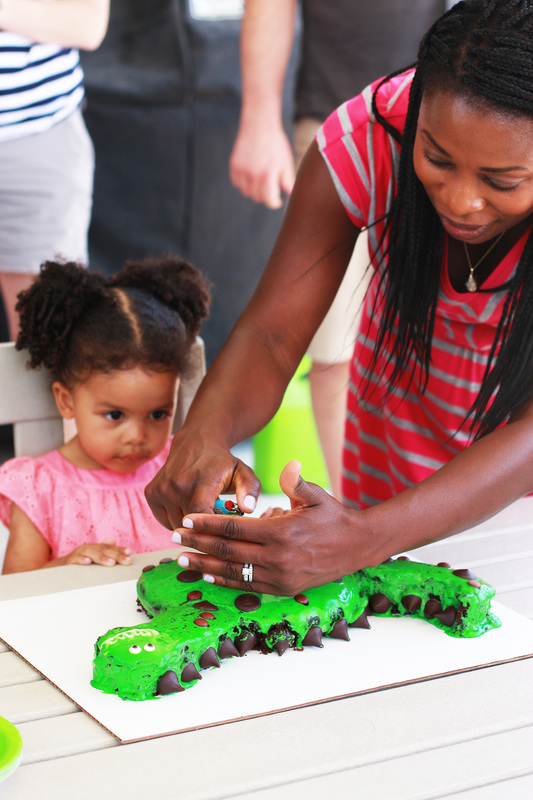 1 Response to "Maia’s Vegan Dinosaur Birthday Cake"